How can you sell to Large Companies? In companies with 1.000+ employees the buying center on average consist of 34 employees in contrast with B2C where the customers are the people who purchase. 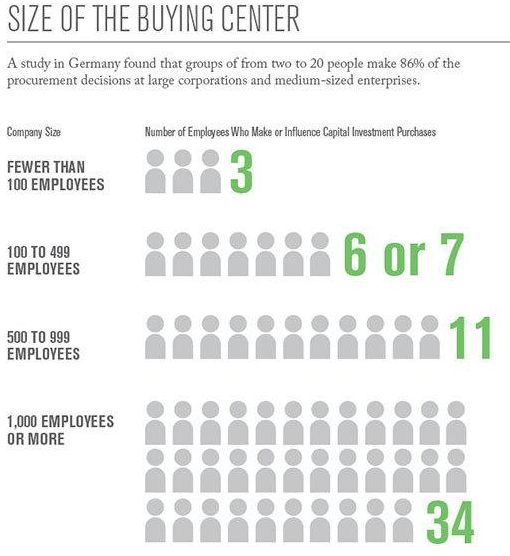 As identified by Gallup “a recent study in Germany, for example, looked at the purchase decisions made by buying center members in mechanical engineering, electronics and automation industries. Almost eight in 10 decision-makers (77%) indicated that they disregarded emotions when making purchasing decisions, while seven in 10 (70%) claimed to rely only on objective facts. However, a majority of the respondents (54%) also said that they would let a deal fall through if they had a “bad feeling” about it, despite favorable facts. Not only the size of the buying group is significantly more complex. If your size deal is very high, the risk/ complexity will be a critical factor in your selling cycle. It is probably easier to sell a set of workstations to a small SBM that to have a 3 year agreement for workstations, warranty and updates with a 10,000 employee company. The two selling processes will have very little in common. Selling into the blue-chips can be a long, tiring and let’s face it, expensive and complex process. This is why Account Based Marketing on top accounts is having so much success. If you want to know more details on what are the best practices in B2B Sales and Marketing to Large Accounts, do get in contact with us. Now it’s time to move beyond the hype.